The Nash Equilibrium is obtained when the Stock Price (SP) appears to more or less track the Risk Price (SF) for long periods of time which are, typically, measured in years but never forever, and that observation allows us to extend our (B)(N)-portfolio rules to a number of stocks that we would like to own but which we technically can’t own without breaking the rules. For example, we would probably like to own JNJ Johnson & Johnson and KO Coca-Cola (please see Exhibit 1 and 2 below), and we can, but if we are going to break the rules we should also be prepared to deal with less than attractive consequences such as BAC Bank of America Corporation (Exhibit 3) or GS The Goldman Sachs Group Incorporated (Exhibit 4) and be cautioned by a number of other facts that we have often discussed in these Letters. We understand, of course, the Contra Portfolio (N) – please see, for example, our Post on the NASDAQ 100 – (B)(N) There And Done That, June 2012 – and the general behaviour of stocks that are not (B) is not one that we want to blunder into. Johnson & Johnson is, of course, the name-brand global producer of nearly half the products in our kitchen, bathroom and medicine cabinet. It pays its shareholders of three billion common shares currently valued at $190 billion more than $6 billion a year in dividends but, alas, none to us. In the Chart, the Risk Price (SF) is the Black Line and the Stock Price (SP) is the Red Line and both are step-functions (please see our previous Posts if that is not clear). The daily high and low stock prices are the thinner black line and grey zone below it. 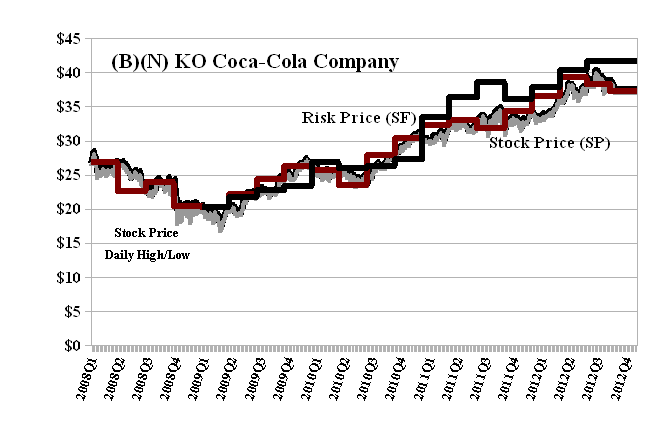 The case of the Stock Price (SP) ≈ Risk Price (SF) (a kind of “tracking” relation that is evident in JNJ and KO, and also BAC, below) is an instance of a “Nash Equilibrium” which – if we take some time to understand it – will help us to resolve our investment angst and better understand our investments in these companies, if any. The Coca-Cola Company is a manufacturer, distributor and marketer of non-alcoholic beverage concentrates and syrups in the world. Indeed, we and billions of others had some today and this $170 billion company pays $4.5 billion per year in dividends to the shareholders of its 4.5 billion common shares. Prosit! Bank of America Corporation is a bank and financial holding company which provides banking and non-banking financial services and products throughout the United States and in selected international markets. This $90 billion company (down from $180 billion two years ago and $360 billion two years before that) manages $2 trillion of depositors’ money but doesn’t look like it’s going anywhere itself but down and the $400 million per year in dividends ($0.01 per share per quarter) that it pays to its shareholders is just “life support”. But, of course, that’s just our opinion and there are many others who think otherwise and “like” the stock else it would have no price at all. Zero. 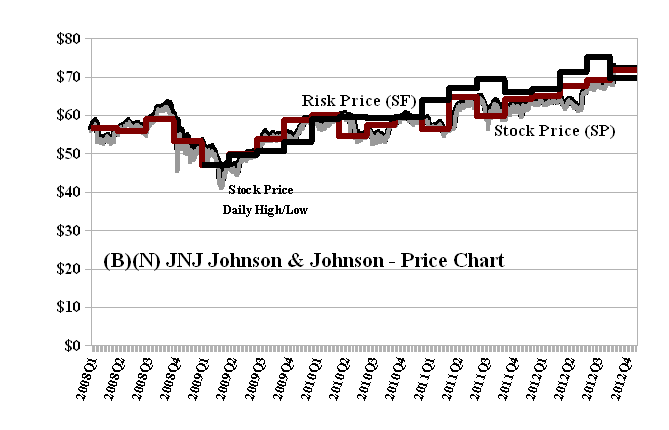 In this case, the Risk Price (SF) appears to be tracking the Stock Price (SP) downwards in contradistinction to the case of JNJ and KO above in which we would say that the Stock Price (SP) is leading (or validating) the Risk Price (SF) upwards (and there is an implied causal relationship in this description). The distinction between tracking upwards and downwards and who is “leading” can be more easily understood by considering, for example, the 90-day government T-bill in which there is only one uncertainty (inflation). The current price is decided by auction using sealed bids and if the current price is, say, $95 (which is the Risk Price for the bond with face value $100) then the consensus now is that inflation will not exceed 5% in the next three months. In the after market, the bond could trade for anything. An investor with cash and belief that inflation will not exceed 2% may be prepared to bid $98 for the bond for which the current holder paid $95 and, if they sell, then they are satisfied with a $3 profit and that inflation will not wipe that out in the remaining time. In other words, the current bid price is leading the risk price upwards pending the next auction and an asking price of $98 would have the same implication except that in this case, the bond holder is saying that they are satisfied with a $3 profit and that it will remain so. The Goldman Sachs Group is a global investment banking, securities and investment management firm. Its three segments are Investment Banking, Trading and Principal Investments and Asset Management and Securities Services. 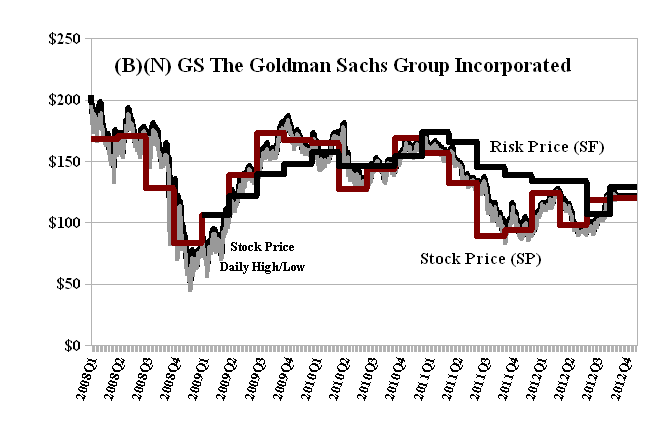 The Goldman Sachs company has a highly variable market value of between $40 billion and $80 billion which it can’t seem to manage despite its business profession for others and the payment of US$1 billion a year in dividends (US$2 per share) to its shareholders and the opportunity to manage nearly $1 trillion of other people’s money. Astonishing! The Stock Price Chart (Exhibit 4) is typical of (N)-behaviour – we have not had an interest in the company since between $70 and $170 two years ago despite a nearly 20% increase in the stock price this year and we won’t buy it again until the stock price plausibly tends to exceed its Risk Price (SF). To us, it’s been a speculation or gamble since early 2011 and we avoided entirely the long tumble from $170 to $90 in 2011 (a drop which, we suspect, no one could actually explain any more than they could tell us tomorrow’s price). 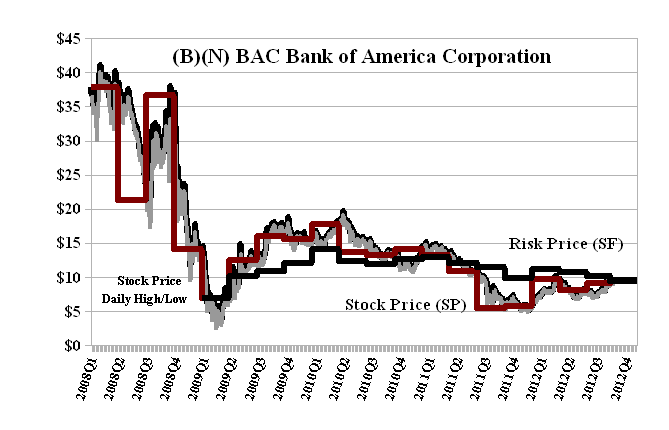 The rule is that we will only buy or hold the stock of a company if the Stock Price (SP), or the “stock prices” in the context of market volatility (please see the Charts), plausibly tends to exceed the Risk Price (SF) which is calculated from generally known (and, therefore, often three to six months in the past) balance sheets of these companies. Such companies are designated (B) and all the others in the same market or domain are designated (N) at that time. We “sell” our stocks whenever there is a (B)- to (N)-transition and whereas we are generally indifferent to the purchase price, “selling” is a discipline. Please see, for example, The Wall Street Put, August 2012, for a description of the “buying” and “selling” disciplines. The “Nash Equilibrium” is a remarkable discovery of the American mathematician John Forbes Nash in 1950 that provides a solution to finding the outcomes of repeated cooperative (that is, enforceable) and non-cooperative bidding processes (some people say “games” but we’re talking about our money here) for which the differential calculus and other optimization techniques provide no insight at all and, of course, the Capital Assets Pricing Model (CAPM), developed at about the same time, is provably and obviously meaningless despite its widespread “convenient” application to “portfolio management” and the management of risk reduction but not risk aversion. Please see our Post, Adrift and Starving on the Risk Appetite, July 2012. The Nash solution is that if (X) is an array of all the bid and ask prices of one company or many, perhaps all, then a Nash Equilibrium is obtained when the market is cleared as the values (prices) in (X) are moved from one position to another in successive bidding and asking and, eventually, there is no “economic free good” that is acquired by any of the parties. That is, no party (investor) can make further gains, where “gains” and “losses” are defined by their preferences which might not only or all be about “money”, without a “loss” to at least one other investor. We can prove (in mathematics and economics) that under a reasonable set of preference relations that define observable societal standards of risk aversion – namely, and prosaically, that we do not invest our money in order to have a better chance of losing it – that the equation Risk Price (SF) = Stock Price (SP) obtains a Nash Equilibrium of stock prices. Please see our Post, The Price of Risk, August 2012, for more details, although we can explain here how that might come about and what it means for investment risk management. The Risk Price (or the price of risk) is exactly defined as “the least stock price at which a company is likeable” (Goetze 2006) and “likeability” is defined by the behaviour of portfolios of stocks that are deemed to be “likeable” by whatever criteria we choose with the additional requirement that the portfolios of likeable stocks (B) and those that are not, (N), separate the market, that is, a company in the market is either (B) or (N) at all times. It seems like not a high hurdle but the most commonly “likeable stocks” have low Price to Earnings Ratios (low PEs) and that doesn’t work, unless we “like” losing our money for reasons that we can’t understand. Please see our Letters, Volatility for the Delta Challenged, June 2012, and The Wrong Tools Eventually Strip All Nuts, August 2012, for more on that. In order to prove the Nash Theorem, suppose that (X) is an array of bid and ask prices that we will call an “offer”. The array (X) might be for one stock and just one investor bidding and asking to themselves, so to speak, or all the stocks and all the investors in a given market or domain. It’s reasonable to assume that whatever is in (X) is enforceable so that, for example, if an investor bids $50 for a stock with an asking price $20, they are likely to get it for $50 rather than the more charitable $20. However, enforceability (which is also called cooperative) is not a requirement of the Nash Theorem which has other ways of ensuring sensible results. A “counteroffer” to the offer (X) is an array with content similar to that of the offer (X) in which every investor in (X) has improved their position relative to the offer that they made in (X). “Improvement”, of course, might not just be only about “prices”; it could be, for example, about quantity because some investor wants to buy more or all the stocks or it could be about quality because some investor perceives an advantage in terms of capital safety and possible investment returns which is important or has become important to them. Or it could be about necessity because some investor needs their cash (liquidity) and they might, therefore, lower their asking price or raise their quantity for sale or both. In any case, narrowly focused goals such as “profit maximization” or “variance reduction” would appear to be lonely and singular or “rent-seeking” objectives without much traction in the real business of our society. In general, for every offer (X) that appears there will be many counteroffers so that the mapping from offers (X) to counteroffers is “set valued” with results that are similarly structured to (X) and which all look like “offers”. The Nash Theorem (1950) then says that with two other reasonable conditions on offers, there will always be an offer that is in the set of its counteroffers and which, therefore, cannot be improved upon; it is, in effect, the “best offer”, although there will also be, in general, many “best” offers and the investors are necessarily indifferent as to which one is implemented. The additional requirements, without which the result is provably false, are that if (X) and (Y) are offers, then (Z) = λ(X) + (1-λ)(Y), is also an offer where λ(X) means “some of (X)” and (1-λ)(Y) means “a complementary amount of (Y)” and, one can say, the set of offers is “convex” but the meaning can be generalized and become quite interesting in different metrics, algebras, and topologies. We also note that if (X) is an offer then the set of counteroffers to (X) is a non-empty set (else (X) cannot be improved and it is, therefore, the best offer) and convex in the above sense; that is, if (X1) and (X2) are both in the set of counteroffers to (X) and, therefore, both improve on (X), then, as above, “some of X1” and a “complementary amount of X2” should also be an offer and improve on (X). The second condition is a notion of “continuity” which is obviously dependant on the topology that we choose to put on the set of offers and how offers are actually represented in a manifold or vector space; in any case, if (Xn) is a sequence of offers that converges to an offer (X) and (Yn) is a sequence selected from the counteroffers to the (Xn) and (Yn) converges to the offer (Y), then (Y) is in the set of counteroffers to (X). QED because the result now hands off to the extraordinary “Fixed Point Theorem” of Shizuo Kakutani (1941). For more information on RiskWerk, please follow the Tags or Categories attached to this Letter or simply enter Search for additional references to any term that we have used. Related data may be obtained from us (for free) in a machine readable format by request to RiskWerk@gmail.com.